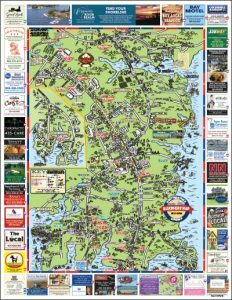 The ONLY dedicated visitor’s map for the lower Northern Neck & Middle Peninsula. Distributed annually at more than 90 locations, including high traffic spots such as the Tides Inn, local hotels, restaurants, gift shops, AND the Virginia Welcome Center rest-stop on I-64 E in New Kent (over 2 million visitors annually). 12 MONTHS of advertising for one low price — Maps on streets from July 1, 2019 – June 30, 2020. Your building drawn on the map and labeled so customers know exactly where to find you. A full-color display ad for your business, designed FREE of charge. Your business and ad highlighted at DiscoveryMap.com. Your business and website/Facebook page highlighted in the Discovery Map App. Maps are published just once a year and ad sales run from March-April every year but you can call or e-mail me to reserve a spot today!